Remember when the Obama administration was caught telling lies to the media and to the American people about the State Department's activities during the terrorist attack on our embassy in Benghazi? Where was the President? Where was the Secretary of State? To this date, nobody knows because Obama and Clinton refuse to answer questions on the issue. Just when accountability reared its ugly head, Hillary Clinton was suddenly hospitalized and therefore unavailable to testify before Congress as to her and her boss' lack of action that led to the deaths of American foreign service officers. Fast forward to Cairo Egypt and the absolute chaos going on there as the Morsy Islamofacist regime was tossed out of power by the Egyptian military. This is the regime to whom Kerry's boss recently gave 250,000,000 in American taxpayer dollars, 200 Abrams tanks, and 12 F-16 fighter jets (with the promise of another eight by the end of this year). One might think that such an investment in a foreign power might cause one to actually be engaged as that power crumbles live on television before the entire world. But I digress. 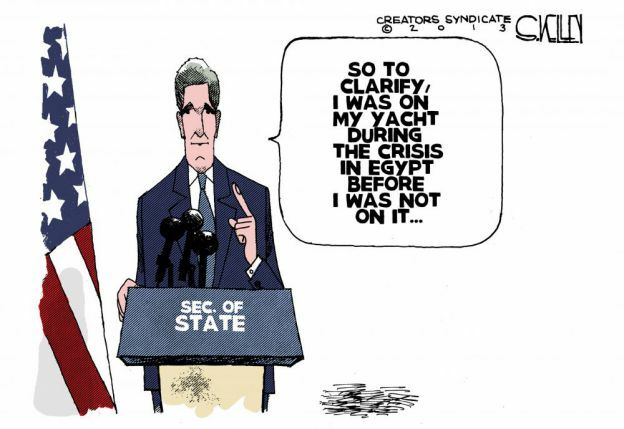 Coincidentally, Secretary of State John Kerry was nowhere to be found as the Morsy regime was toppled. Except that he was. He was found alright; sailing his yacht. When asked about Kerry's whereabouts and then pushed to address the speculation that Kerry was derelict of duty, the State Department did as they are now so well known to do. They lied and denied until they were forced to admit the truth. It should be noted that the Obama administration has yet to acknowledge what the rest of the world already knows. Morsey's ousting was a military overthrow, which has (at least for the time being) displaced the Obama supported Muslim Brotherhood. This is important to call out, because under US law our government cannot support a coup or decree that has overthrown an elected government. The Obama approach is simple. If they don't acknowledge it, it must not exist. This same logic can be applied to Obama's approach to dealing with the economic devastation our country will suffer under Obamacare. Again I digress. I can't help but notice the coincidence here, but shortly after photographic proof surfaced proving that Kerry was indeed on his yacht during the coup, low and behold, his wife Teresa Heinz Kerry was hospitalized. I suppose admitting John Kerry himself to the hospital like Hillary was would have been more far fetched than Kerry admitting he's in over his head and way out of his league. I wish no ill will whatsoever on Mrs Kerry. I just can't help giggle at the coincidence.